Last Monday, August 4th was our wedding anniversary. Sid and I have been married 18 years. But since we started courting when I was 15 years old and he was 16 years old, I can say that I have been with him over half my life. In 3 more years, I will be able to claim being with him for a quarter of a century. 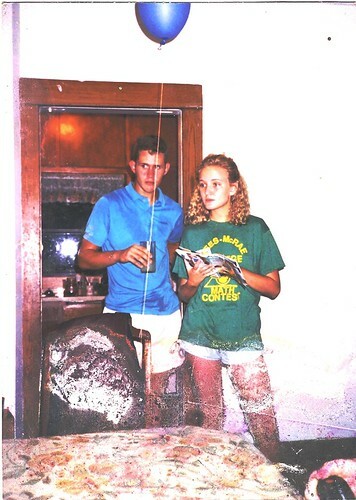 My mother-in-law found an old, partially damaged picture of us taken at Grandma Louise’s house in Great Bend, Kansas. The picture was taken either in 1989, one year before we were married, or in 1990, a few weeks after we were married. I am so thankful to my inlaws for my husband. I can truly say that as wonderful as I thought he was at 16 years old, he has only become better with time. I’m pretty sure this was taken before you were married in 1989 (the summer Knocker and I married and went off to Kansas with the family). I took lots of pictures of you guys that season in those same outfits. this picture just made me smile. it brought back sweet memories of you and sid together. you guys still make me smile. happy anniversay! You are right Laura. You jogged my memory. In my wedding photos, my hair is longer and not permed, so this picture must have been taken the previous year. I’m glad you took pictures or I would not have had any from that Kansas trip.